I was up early Saturday morning cooking baked potatoes for the trip. I was out the door and onto McDonalds for coffee with a pile of streamers in my hand that I tied the night before. I met Anthony Williams who is a co-founder of Calvary Outfitters http://www.cbcol.net/page.cfm/747 and Chris Robinson who is a regular attendee at the monthly meetings. Anthony and Chris live in Murfreesboro, TN, Anthony is a regular on the boat, but this was Chris’ first time on the boat as well as his first time fishing with a fly rod. Anthony had set up our trip by telling Chris “the weather looks good for Saturday”. We were on the Caney Fork about 8:30 a.m., The Army Corps was cranking one generator and the snow was coming down sideways. Yes, Chris did mention Anthony’s statement of “the weather looks good for Saturday”. I’ve been out in worse weather, but Chris was a newbie……at that time in the float anyway, and had yet to experience a truly bad weather day. For the first few minutes we worked with Chris’ timing, but it did not take long for him to get into a rhythm. Within 15 minutes Chris caught his first trout, had the hero shot and was casting for another. Before we left our first stop Chris had 5 fish including a brown. Anthony was trying several different streamer combinations, fielding weather questions from Chris, while catching his share of fish. We were off to pound the banks. We watched fish after fish come up from the deep to chase, examine and even hit the streamers. There is nothing like seeing a trout chase a streamer, take a shot at it, miss and come back for two and sometimes three more takes. Before lunch we ended up back on Clousers, similar to what we fished this time last year. We started picking up larger fish as we hit the better lies in the river. Anthony caught a large bow and a nice brown when we stopped at one of the better lies in the river. Since it was my “lunch break” I took a few minutes to fish. Chris came down to join me and landed the biggest bow of the day, while I managed the net. After lunch the water began to go down and we began our float out. We lost a nice fish a few miles down from the dam , but before we made it to the ramp we had a nice double of two 16” bows. It did stop snowing, but the weather never really did warm up. We pulled into the ramp just about dark, we were off the river and on the road just after the sun went down. On the way home we stopped by McDonalds for one more cup of coffee, which ended the day much like it started. The day started early watching the Weather Channel and getting flies ready for a float with Brent Fuller and Mark Smith from Chattanooga Tennessee. During the stop for gas, coffee and an apple pie my phone rings. I look at the clock and it is 5:30 a.m. Mark is on the line and they are at the ramp…one hour early. They have the bug bad, which is evident from a couple of things. One, it’s dark at 5:30 and two; it’s less than 30 degrees. But, having “it” bad is not always a bad thing. I strung up the streamer rods and put one in each of their hands. With one generator running we began pounding the banks for opportunistic browns who want to attack unsuspecting bait fish. Brent and Mark have spend more time nymphing than anything else and on this day they received a crash course in Streamer 101. I would rate their grade an A considering they didn’t know what I was going to get them into. Brent was the first to hook up and soon had what he said was the biggest brown he had ever caught. Mark wasn’t too far behind catching browns. We fished down the river and Mark’s Wooley Bugger found a tree limb sticking out over the water. He finally shook it loose and we floated on. Mark missed several fish against the bank in an extremely good stretch of flat water. After a quick inspection of the Wooley Bugger we found the point was missing. So we stopped and changed flies and fished a run above Lancaster where we picked up a couple more nice browns. Brent caught another brown, which was larger than his previous record. Below Lancaster we stopped while Mark picked up a few by swinging a midge pattern through some swifter water. I re-rigged the rods and we floated into the middle of a real life Caney Fork traffic jamb. We picked our way through the boats and people and stopped at Camp Crossover for a good shore lunch of burgers, chips and drinks. Anthony Williams made a drink delivery in his canoe to help quench our thirst and to join us for a burger. The water had pretty much fallen out after lunch, so we tried a couple different nymph and midge patterns. These patterns did not reveal huge results, so we got back on streamers and picked up a couple more browns. Overall it was a pleasant day. Brent and Mark were fun to fish with and their excitement was notable. Thanks to Anthony for stopping by with the drinks and snapping a couple photos as well. 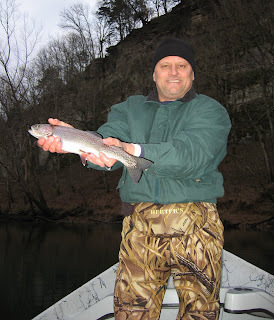 I reviewed a Department of Biology, Tennessee Technical University study which states “there is no evidence that brown trout reproduce in the Caney Fork River”. This may be true, but if this is true the brown trout, that are stocked in the Caney by the TWRA, are doing relatively well by anyone’s standards. I floated Saturday with Anthony Williams and Mark Roberts of Murfreesboro. We launched below the dam on a cool and cloudy morning and after a few pulls on the oars we were hooking up with several brown trout on streamers. 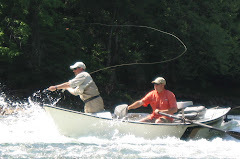 Once someone gets a taste of browns on streamers it is difficult to sway them back into any other type of fly fishing. 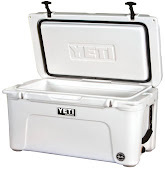 The strike is as exciting as anything in fly fishing and the reward can equal quality fish. Some days, like Saturday, these rewards came early and often. We fished everything from sleek Clousers to big bushy bunny strip flies. Down river, Mark decided to change flies and selected a big bunny strip. Anthony and I could tell by the jumbo jet sound the fly made, when it came by our ear that this fly was meant to drum up the big fish. Several healthy browns had been boated, but Mark was in search of big game. Twice the fly was flashed by big fish. 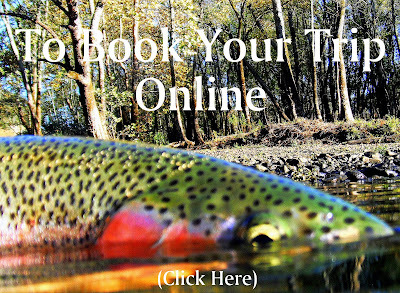 The bunny strip didn’t let us down and the big fish of the day, a rainbow, came from the deepest part of the river. The fish hit (fishing term: Hit- "tried to kill") Mark’s fly and won a chance to have its photo on the internet. After the shore lunch of juicy hamburgers we got back into the boat and onto the river. We struck out for a while, just watching fish chase the streamers back to the boat and refuse at the last second. Seeing the chase is part of the fun, but seeing the take is the Cool Whip on the Key Lime pie, and toward the end of the float we rallied catching a couple more browns before the take out. Despite a misstep in the forecast by the weather guessers, overall it was a very good day.